J&S Chemical’s specially formulated hydraulic fluid is a high performance, fire resistant water glycol that is the best in the industry. 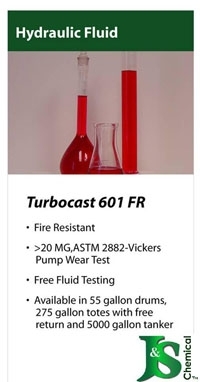 TurboCast 601 FR provides excellent corrosion protection, cleanliness,lubricity, and anti-wear properties thus reducing pump and equipment wear. Unlike our competitors who supply different grades of hydraulic fluid varying in quality and performance, J&S only markets a single fluid of the highest possible quality.